If selected, you'll get $2,500 to put toward moving expenses and receive a $500 monthly stipend, with a $1,500 lump sum given at the end of the year. That could go a long way in a city where the average rent on a two-bedroom sits at $658, according to the personal finance site Nerd Wallet. That's especially true since participants have the option of living in a fully furnished apartment in the arts district with 33% off the base price and free utilities at the start of their time in Oklahoma. 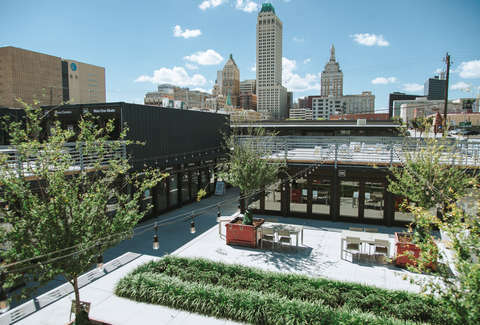 Grantees are provided with a co-working space at 36 Degrees North, which Tulsa Remote calls a "basecamp for entrepreneurs." There will also be meet-ups with other grantees, discounted rent, "community office hours," and skillshare workshops. The only catch is must already have a job where you can work remotely, and you have to commit to working in Tulsa for an entire year. "We want to provide people with everything they need to be able to come and experience the business and cultural opportunities that Tulsa has to offer, without having to leave the job they love," Ken Levit, executive director of the foundation, said in a statement. "This program not only gives workers the economic ability to work remotely, but also the chance to thrive in the city with direct access to the community and other program participants." "Tulsa is a generous and welcoming city, and through this effort, we hope to draw remote workers who can further complement our talented workforce," Ken Levit, executive director of the foundation, said in a statement. "Over the past ten years, the Foundation has worked with numerous community partners to bring more than 1,000 young people to Tulsa. We could not be more proud of the contributions of Teach for America, City Year, and the many artists of the Tulsa Artist Fellowship who have joined the Tulsa community." The program is focused on exposing young workers to what the city has to offer in terms of its culture and affordable lifestyle. That's a slightly different approach than the Vermont program, which is state-run with the aim of getting young people to move to the state in large part because of the state's aging populace and the tax issues that has created. So, will you soon be living in a brand new state, brand new state? They're gonna treat you great, give you barley, carrots, and pertaters. Find details about how to apply at TulsaRemote.com.